Tuesday March 30th 1920 It was a fine day. Cora went to the store with Rob early. Hattie and I did a big washing. Two of the Nipler girls from St Louis were here for dinner. We took a ride and went to the depot with them. Come right back to wash dishes and finish up the washing. Hattie out for supper. I rolled the clothes and washed the dished. Cora back to work in the store. Wrote Alice Condon. 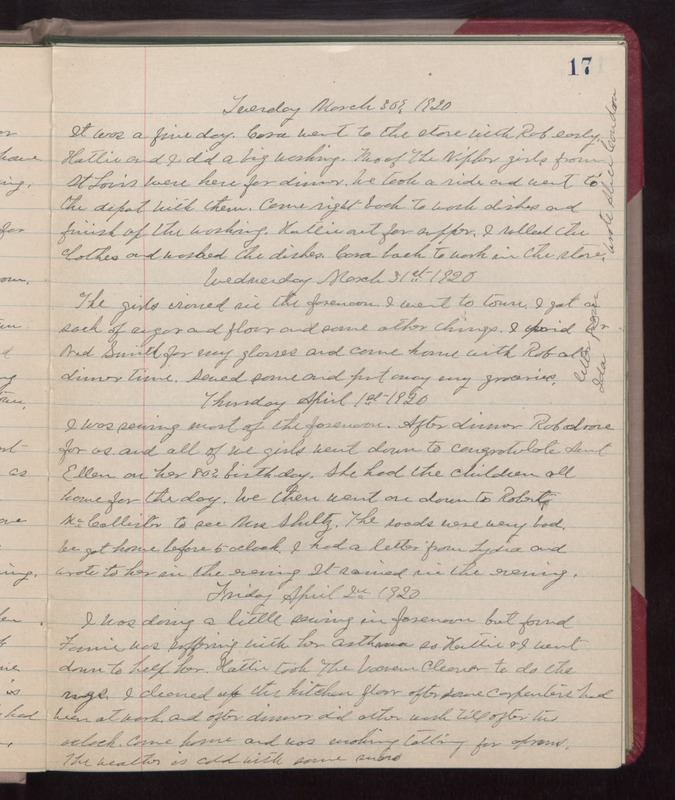 Wednesday March 31st 1920 The girls ironed in the forenoon. I went to town. I got a sack of sugar and flour and some other things. I paid Dr Ned Smith for my glasses and came home with Rob at dinner time. Sewed some and put away my groceries. Thursday April 1st 1920 I was sewing most of the forenoon. After dinner Rob drove for us and all of we girls went down to congratulate Aunt Ellen on her 80th birthday. She had the children all home for the day. We then went on down to Robert McCallister to see Mrs Shultz. The roads were very bad. We got home before 5 oclock. I had a letter from Lydia and wrote to her in the evening. It rained in the evening. Friday April 2nd 1920 I was doing a little sewing in forenoon but found Fannie was suffering with her asthma so Hattie & I went down to help her. Hattie took The Vacuem Cleaner to do the rugs. I cleaned up the kitchen floor after same carpenters had been at work and after dinner did other work till after two oclock. Came home and was making tatting for aprons. The weather is cold with some snow.